J.R. got me a Canon Rebel SLR camera for Christmas, which is so awesometastic there are no words. I haven't had much time yet, but I fully intend to embark on a photo quest of magnificent proportions ... or I may just take a bunch of random pictures of my dogs. 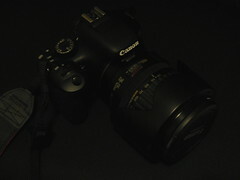 Either way, fantastic present and an easy way to an obtainable New Year's Resolution: Learn how to use my new camera.